Regular maintenance is the best way to keep your car running properly. 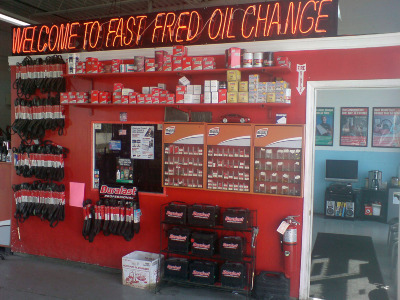 Your "Fast Fred Oil Change" is an oil change expert. No job is too routine for our skilled technicians to give anything less than the top of the line service Fast Fred Oil Change is known for. 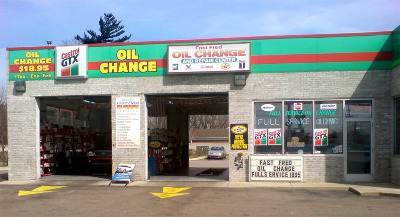 Along with your vehicle’s oil change, our expert technicians can take care of your fuel filters, lube, radiator, antifreeze, fuel injector cleaning and leaks. 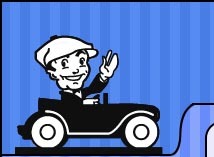 We will also give you a complete vehicle inspection for free when you come in for your oil change. In fact, you’ll find a full line of comprehensive car maintenance packages at Fast Fred Oil Change. After all, it’s the most affordable way to keep your car running smoothly. It’s recommended that you change your oil every 3 months or 3,000 miles to help keep your car running at peak performance, deliver better gas mileage, and handle and ride properly. One of the most common mistakes you can make with your car is to let things as simple as an oil change slide. That’s why it’s important to pay a visit to your Fast Fred Oil Change once every three months or 3,000 miles for an expert oil change and free inspection, performed by guys who are trained, tested and top-of-the-line. When it comes to reliable car care … "Don’t Worry ... Call Fast Fred Oil Change!"